Now let’s focus on the “literacy” part of Language and Literacy. At this age, literacy development is supported most by reading to your child so that your child hears new and different words, learns about different things and situations, and learns how books work. This knowledge will make learning to read easier and more exciting for your child. Doo you remember a favorite book from your childhood? Who read it to you? What made it memorable? How do you involve your children in reading? Daniel Tiger's Neighborhood: Big Brother Daniel - Daniel helps calm baby Margaret by reading a book to her. 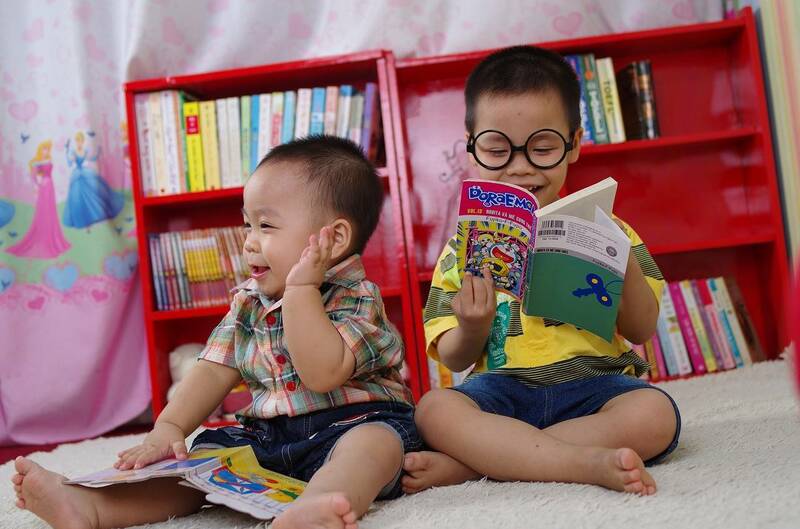 Look at books often with your child to help develop early speech and language skills. Super Why: Alpha Pig's GO Game - Have fun with Mother Goose with this silly video from Super Why. Early readers can help Alpha Pig find the letters in GO. Martha Speaks: Stories - Read these Martha Speaks online storybooks with your child to help build vocabulary and develop speech and language skills. Daniel Tiger's Neighborhood: Coloring - Let your child see your writing and drawing often. Encourage your child to pick up a crayon and draw freely or color pages like these from Daniel Tiger. Martha Speaks: Listen - Go on a listening walk with your child to listen for the sounds all around. Do you hear rustling leaves, sirens, or a school bell? Ask your child to tell you about what they hear and see around them. Dinosaur Train: A to Z app - Help build your child’s reading skills with this downloadable app with literacy games from Dinosaur Train. PBS Parents: 27 Beloved Rhyming Books for Kids - From “Chicka Chicka Boom Boom” to "Good Night Moon,” read these classic rhyming books to your child to help develop early literacy skills.